Single Agent Quick Check is Back! $50.00 per month/10,000 number lookups per month. Quit anytime. *Note: We couldn't get these for awhile, as our top supplier discontinued this great program. We asked them to reinstate this product just for us in July 2015. 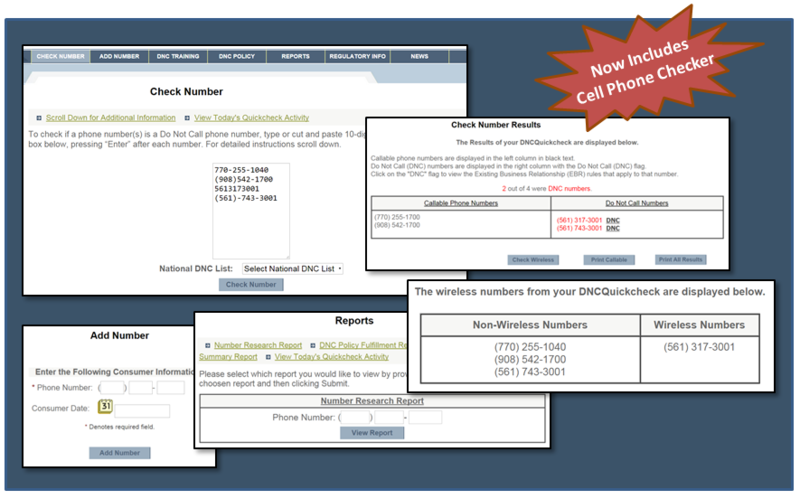 By far the best protection available today for individuals and small groups looking for squeaky-clean DNC TCPA security - And perfect for B2B safety after the 2013 FCC Cell Law updates. Add up to 4 additional ID's N/C. Fast & Easy Single-User Quick Check: This is the top compliance tool in our industry for individual agents. Designed to help Independent Real Estate Agents, Mortgage Brokers, Financial Consultants, as well as B2B software and tech salespeople needing cell identification from social media sourced lists. Anyone reaching out to call consumers and other businesses. Internet based for instant results one at a time, or up to 100 numbers at a time. Simple to use, yet has the backing of our top DNC Compliance provider. This is the same company that provides data hygiene for the National Registry as well as certifications for PACE (Formerly the American Teleservices Association). You can add up to 4 additional ID's. The program is month to month, so you can quit anytime. It just doesn't get any better than this for individual agent calling protections today. This is the same product my $30,000 consulting businesses get. Previously unavailable in single units, our professional callers love this program. Don’t fall for “Free” or “Trial” Do Not Call Offers, downloading software or vendors not including additional State Lists – they won’t be there if you have a problem. Again, this is a special offer month-to-month, so you can try it out as long as you like. If you only take one thought away from Do Not Call Protection, remember the critical importance of having a competent third party compliance provider in place for your calling initiatives. Even if you're just contacting other businesses! (Smart TCPA litigators know cell phone laws changed October 16th, 2014 and are now subject to business calls.) Don’t call me and say, “Bob, I should have let you handle my DNC chores – now we’re waiting to hear if the State AG will hit us with a cease and desist”. It’s a proactive gig. Neither I nor anyone else can help you AFTER you have a problem without proper DNC Law preparation. In fact, if you try to cover up after an incident, it’ll make a bad situation that much worse. It’s more important than ever to protect yourself when reaching out to consumers. Quick Check makes it easy for individuals and small groups. Quick Check actually includes the new 5 States that don’t allow even hand dialing of Cell Phones. Includes: DNC Policy, Company Specific In-House List and all the Policies, Procedures and Enforcements you need to help pass a Safe Harbor Assessment from Government Agencies. A perfect track record over the last 15 years. Backed by the top player in our industry. Call me for easy signup at 561-317-3001. We'll even walk you through the National List Registration process (Free for B2B callers of course) - And you can quit whenever you want without penalty. A note to B2B (Business to Business) callers: It's time to at least identify cells and check numbers before you call. These records are critical today as more cells populate your social media sourced lists. This will get worse before it gets better, especially now that cell owners are classified as neither consumers nor businesses - just cell owners. Be smart and let us keep these records on hand in the timeframe and format you'll need should you ever have a problem.